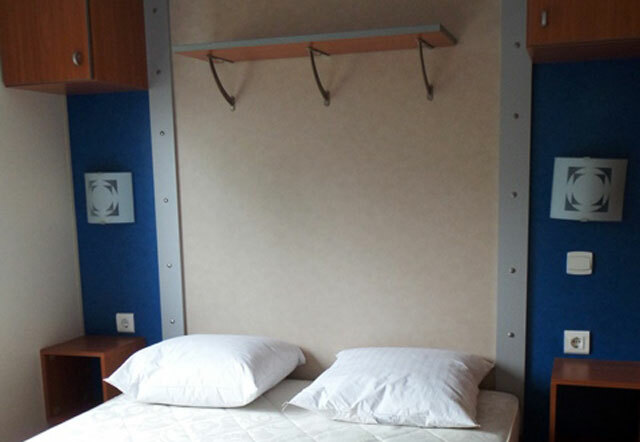 Children’s bedroom with two 80cm x 190cm beds and a 3rd 70cm x 190cm bunk bed. Duvets and pillows are provided (Clients are responsible for household linen). 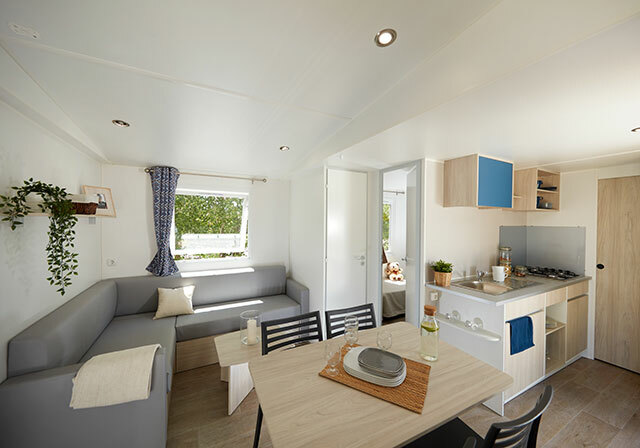 Our mobile homes benefit from a fitted kitchen with pots and pans, a lounge area with sofa-bed for two persons, and cupboards with hanging space, a bathroom with a shower cubicle, sink and a separate WC. They are also equipped with a terrace and garden furniture. 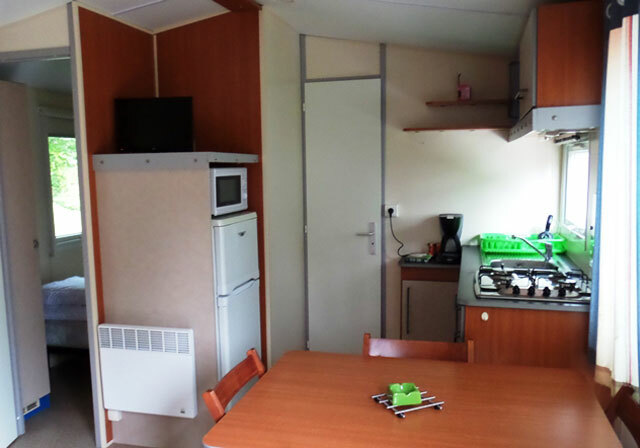 Equipped kitchenette (fridge / freezer, microwave oven , cooking stove, coffee maker ) , flat screen T.V. .
Terrace with large table for 6 to 8 people , chairs and umbrella . Barbecue available on request at the reception. 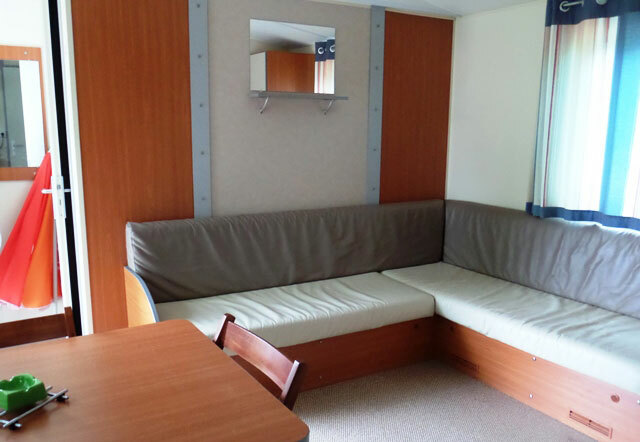 - One bedroom with double bed of 140 x 190. 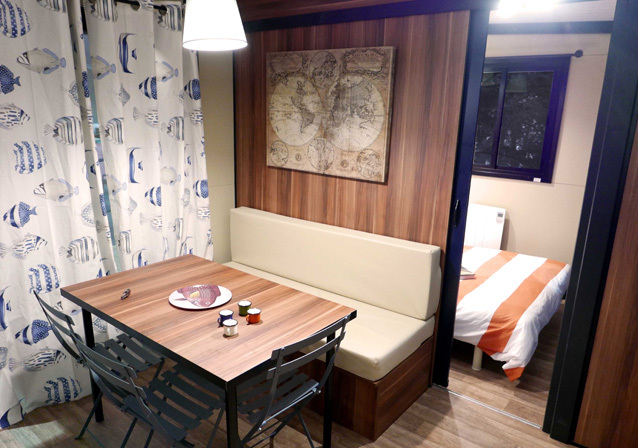 - One bedroom with twin bed of 80 x 190. - Open up kitchen on the outside. - Half covered up patio of 18 m². The Ottawa chalet, a trensetting concept with its unique exterior and an elegantly spacious, light interior, offers unparalleled comfort levels both inside and out. 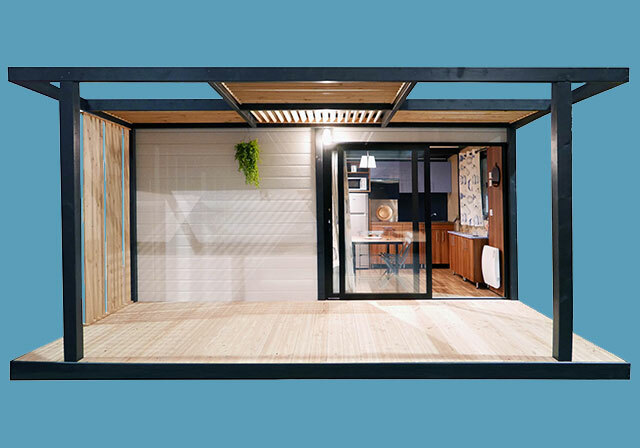 - 14 m² covered outdoor terrace. 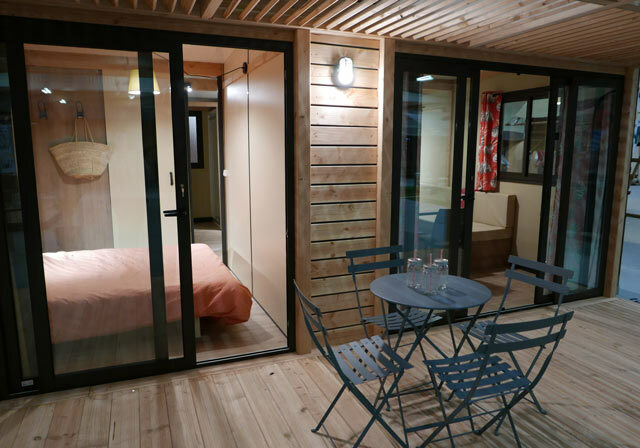 NEW FOR 2017 – CHALET NOUMÉA ! 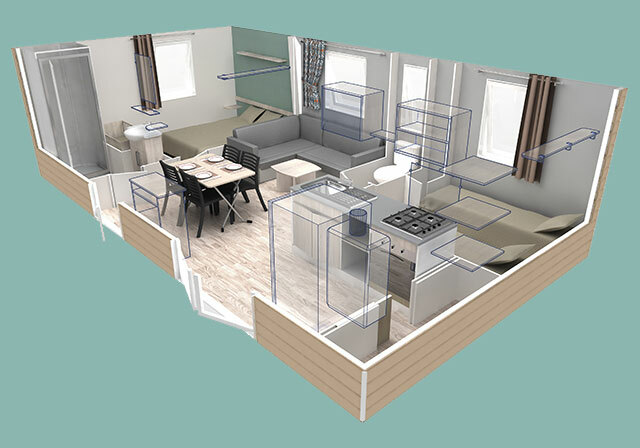 25m² living area, a 12m² covered terrace, 2 seperate bedrooms, with the possibility to sleep 5. 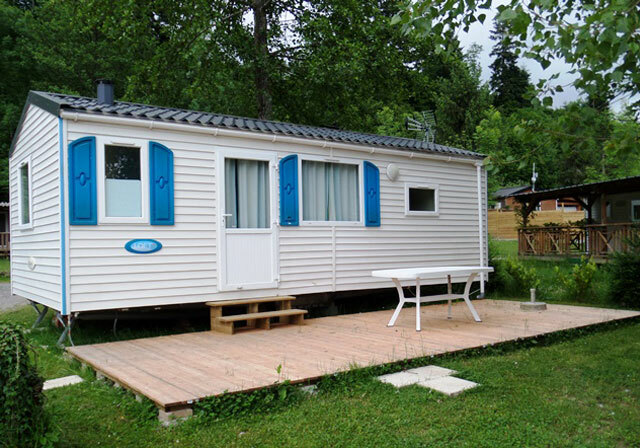 Stay in the chalet Nouméa ! This accommodation offers everything to enable you to fully enjoy your stay. Everything has been designed to allow you to spend an unforgettable family holiday. 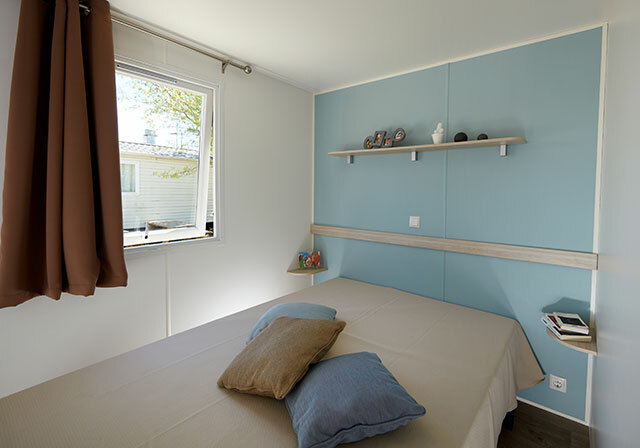 You have a main bedroom with double bed, as well as a children’s bedroom with smaller beds. The dining area and the covered terrace are perfect for family dining at any time. Above all, your children need space, intimacy and comfort. 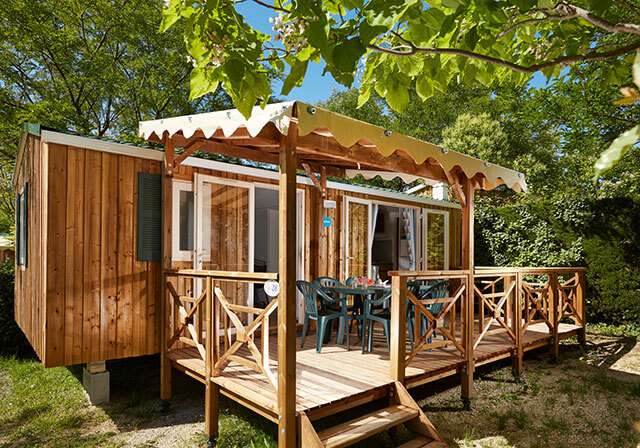 A chalet Nouméa is the promise of family holidays in the best conditions. When the shower-time bell rings, head to the equipped bathroom! 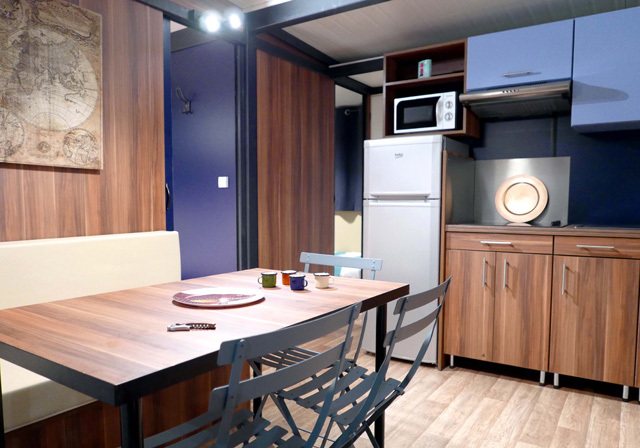 Don’t refuse them anything and choose the best for their holidays in a chalet Nouméa. The lounge, which faces the exterior, benefits from all the light provided by the 2.4m patio window. 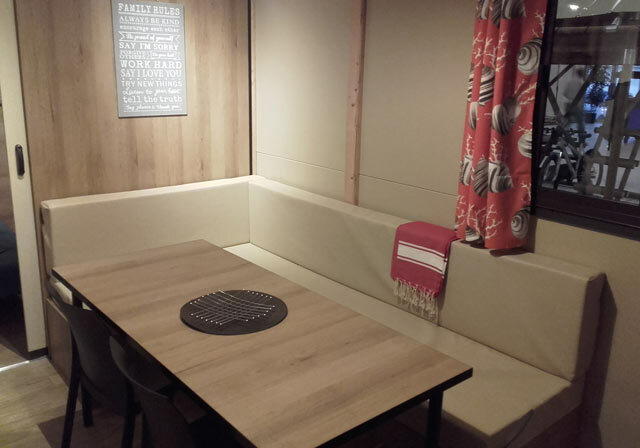 To guarantee holidaymakers’ comfort, a bench replaces the chairs around the table. A 1.4m x 2m double bed, complete with two wardrobes and a bedside table equip the main bedroom both cosily and elegantly. Designed to sleep 3 persons, this bedroom is ingenious in the way that it combines comfort with storage space. The chalet’s kitchen has the equipment to allow meals to be easily prepared for all the family and friends. A refrigerator and a 4-ring hob are amongst the equipment which will make guests’ lives easier. The hot water tank is located outside the chalet. 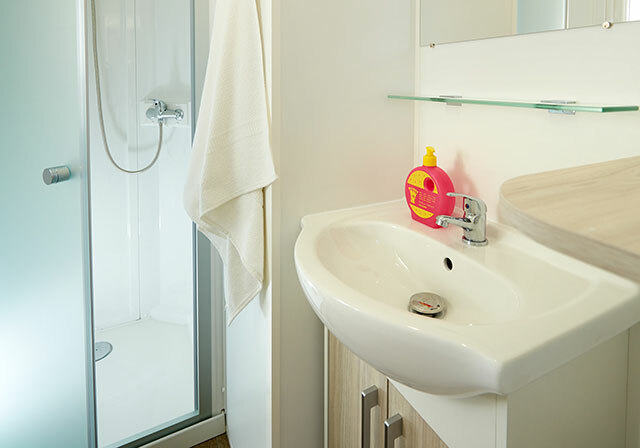 The bathroom, optimised for space, allows the bedrooms and lounge to be more comfortable.